I recommend this book to American's who are interested in learning the history of America and its failed manifest destiny policy. It is disheartening to know how the U.S. (in the guise of "helping free" the Philippine people from Spain) killed and tortured hundreds of thousands of Philippine Citizens.The title comes from a reference to the Filipino people made by President Taft. It is sad that in the year 2010 this superiority complex is present in the U.S. when dealing with third world people. 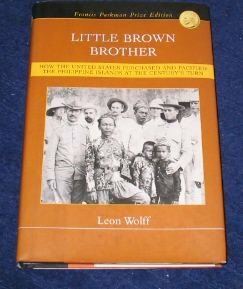 An excellent book to help the reader understand the history of US - Philippine relations.This provides detail and insights of the events of the time, 1898 - 1946.Aids understanding of what positive and negative influences the bonding of two cultures had on the people (US and Filipino) at that time and on the feelings held to this day. I recommend this book and "In Our Image" by Stanley Karnow as solid reading for the student of culture and history. Leon Wolff graduated from Northwestern University, served in the US Air Force during WW II, then turned to writing. This 1961 book earned a Parkman Prize as the best book of the year. The US went from aiding Filipino independence from Spain to forcibly suppressing their attempt at independence. This story has been diminished in the schoolbooks to avoid the topic of imperialism. There was controversy in the US and Washington, perhaps more than during the Vietnam War or other military actions of the 20th century. This book has the missing chapter of US history. Wolff also wrote about military campaigns which sacrificed troops in ill-conceived and illogical adventures (p.xiii). US officials offered to help Philippine revolutionaries, kept them out of the Treaty of Paris, claimed the Philippines, the started an imperialist war to suppress the Filipino patriots. Paul Kramer is wrong to criticize this 1961 book as not meeting 2005 customs (p.xvii). Wolff makes an error in the beginning. The breech-loading .45 Springfield was not a Civil War .58 muzzle-loading rifle (p.9). The Philippine embroilment marked an end to the policy of avoiding foreign entanglements. The increase in US manufacturing sought new markets (p.13). The great depression of the 1890s led to an end of isolationism. A tariff on Cuban sugar wrecked their economy (p.15). 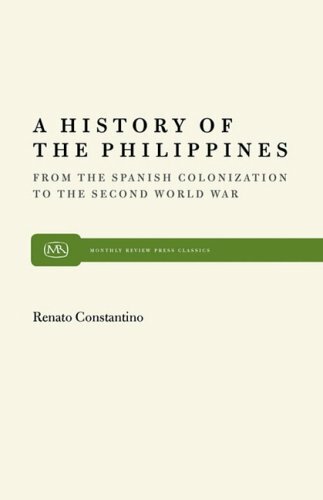 Spanish colonialism and its high taxes, low wages, and harsh laws led to rebellion in the Philippines (pp.16-17). Corporations (monastic orders) owned the best lands and operated by share-cropping (p.18). Dr. José Rizal formed the Liga Filipina. He was arrested for treason and shot, so too were hundreds of others (p.24). A revolutionary army was formed (p.25). Chapter 1 has the background to the insurrection. Chapter 2 begins with the US declaring war with Spain (p.44). The armored cruisers of Dewey easily defeated the wooden Spanish ships. Would the US support Filipino independence or create a US colony? The Filipino army defeated Spanish troops except in the fortress city of Manila. American corporations envisioned great profits from these lands (p.80). The "Monroe Doctrine" was now defunct (p.81)! Manifest destiny (p.83)? Organized religions supported imperialism (p.84). Chapter 4 tells how an army was raised and sent to Manila. Most of the military were traditional state militias. Wolff has a dislike for the democratic militia (p.90). Britain and Germany were determined to keep each other out of the Philippines (p.111). Japan wanted to help administer the Philippines (p.112). The Spanish surrendered Manila, the Americans occupied Manila and kept the insurgents out. The Filipinos controlled the rest of the islands. Could experienced diplomats have prevented the war (p.139)? The constitutional convention at Malolos created "the first democratic constitution in Asia" (p.147). Those who objected to expansionism formed the "Anti-Imperialist League" (p.159). The Treaty of Paris ended the war with Spain (Chapter 7). The US kept the Philippines to keep Imperial Germany out (p.167). Senators were bribed to ratify the treaty (p.196). There were liabilities (p.197). Then the war began just before the Senate vote on the treaty (p.229). The American people knew little about the events (p.253). Censorship shpaed the new (p.262); suppressing freedom of opinion at home (p.275). After being defeated in open warfare Aguinaldo chose guerilla warfare (p.288). The countryside was unsafe (p.294). The Filipinos were disarmed to conquer and impoverish them (p.299). Judge William Taft began to redistribute land and authorized a Filipino Assembly (p.314). Resistance continued everywhere (p.323). The islands were placed under martial law (p.334). Newspapers were censored or suppressed (p.335). General Frederick Funston led a group to capture Aguinaldo (pp.342-345). But the fighting went on. The US brought civilization to the Philippines (p.351); for the survivors (p.352). Military force and slaughter brought an end to the Insurrection (Chapter 14). Agriculture was devastated (p.360). [Did this force Filipinos to migrate as economic refugees?] This book could use a last chapter on the next 50 years. Well written, lively, and concise.Chronicles the extraordinarily misguided and brutal imperial war that we waged against the Philippines at the turn of the 20th century.The resulting mayhem left approx. 250,000 Filipino dead and about 5,000 American dead.Atrocities were rampant on both sides but given the greater firepower of the Americans coupled with fundamentally racist beliefs, the carnage from our side was especially appalling.There is much to be learned by Americans by learning more of this bloody episode.The dangers of third world adventures are laid out very clearly in this account.America needs to fully come to terms with the power of nationalism amongst people of other countries.Short term victories may be achieved, but the long term outcomes almost always lead to the expulsion of the invading forces.Peoples of the rest world want to determine their futures.They don't want us, or anyone else for that matter, making those determinations for them. I cannot recommend this book enough to those who wish to understand the roots of American imperialism and what motivated it.The author presents an honest look at both sides of what was then a burning political question.He quotes not only from media sources but also letters and interviews of soldiers who fought on both sides, court documents, diaries, memoirs and legal papers.He spares no uncomfortable fact and provides a vivid account of both the atrocities and the brutality of guerrila warfare.He also delves into the arguments of congress, the press and the White House for how and why decisions were made (which were mostly due to the political winds of the prevailing election cycle). It's a great eye-opener for those that have never been confronted with the fact that the United States often acted with both greed and callousness.And yet the book is not a condemnation of the United States, rather a look back to what really transpired from 1899-1903 under Presidents McKinley and Roosevelt and America's ill-conceived attempt to enter what it thought was an elite club of nations that practiced third world colonialism. I am in agreement with the other reviewers that this is a very good history of the US/Philippine War that should be more broadly read.Parallels with Vietnam and the present oily Iraqi War are eerie:attacks on the patriotism of war critics to silence them, support of the wide spread use of various tortures against the adversary including "The Chinese Water Treatment" (aka "Chinese Water Torture"--from which "Waterboarding" is only a variation), the excusing of massacres of civilians by American soldiers, etc.There truly is nothing new under the sun when it comes to these dirty little 3rd world wars.I'm reminded of the poet Robinson Jeffers' poem "Blood Lakes. "So many blood lakes and we always fall in--with apologies to Jeffers' spirit if I've essentially misquoted him. Perhaps we can overcome our national "Altzheimer's" on the issue of these 3rd world colonial/neo-colonial wars and stay out of them when the next opportunity presents itself.In the meantime, I would settle for our exit from the present Iraqi mess with all due and reasonable speed.America's moral force and image in the world is not improved by our involvement in such bloody horrors. A very interesting story about the American armies attempt to end the Phillipine insurgency that broke out in the wake of the Spanish-American war.Originally allied with the Americans the Phillipinoes were angry that the U.S had promised indpedendence and from their point of view, reneged on the promise.An insurgency broke out and the American army used classic anti-insurgency methods to break it, including creating institutions and providing incentives for the people not to back it, as well as combatting it.Famous figures such as Roosevelt, Taft, Pershing and Macarthur's father were involved.This is an important part of American history that is often forgotten. 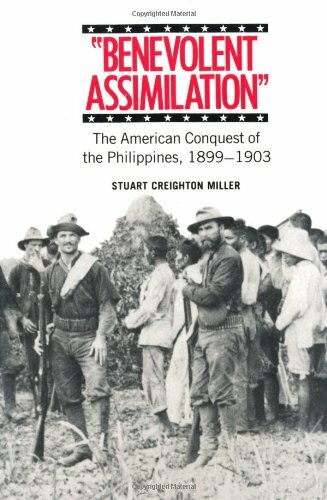 This book reviews the politics and media surrounding the actions by the US in the Philippines following the Spanish-American war.It gives great insight into the propaganda used to sell the war to the American pubic and to obfuscate the atrocities that American soldiers committed there.Miller paints a fascinating picture of egocentric American political and military commands steeped in duplicity and self-delusion; these patterns will be interesting and familiar to any student of the wars in Vietnam and Iraq. The material is sourced mainly from newspaper editorials, political speeches, congressional inquiries and the letters of politicians and high ranking military figures. This book will not tell you anything about what the war was like for the soldiers on the ground, American or Philippino.It won't tell you much about tactics.It won't teach you anything about Philippine culture of the time, either. This book was originally from 1982, written in a time of post-Vietnam regret. 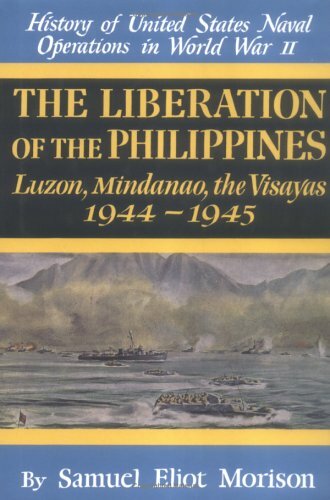 However, this book may have picked up on themes, very much in the U.S. press in the period of the Philippines war of a century ago, that are suddenly current in fall 2005: systematic use of torture by American forces (particularly the "water cure"); carelessness with the lives of civilians in the battle zones; denunciation of Americans with doubts about the war as unpatriotic or traitorous; the denial of normal legal due process to an enemy deemed too savage and inferior to be worthy of it; considerable confusion on the events where U.S. forces transpose one war (i.e., Spain 1898 or War on Terror 2001) into a new one (the Philippines in 1899 or Iraq today) more by act of U.S. will than enemy action. The author does stretch some comparisons between the Philippines war and Tonkin Gulf and My Lai, but given the events of Operation Iraqi Freedom the book seems eerily more relevant now. Located in Southeast Asia, the Republic of the Philippines is comprised of over 7,000 islands. The first known inhabitants of these tropical islands migrated to the Philippines 30,000 years ago over land bridges that no longer exist today. Since then, the Philippines has undergone drastic changes due to large numbers of settlers and colonizers from abroad. For hundreds of years, the Philippines was under Spanish and then United States control.Spanish influence remains a large part of Filipino culture today. Finally, in 1935, the Philippines embarked on the path to independence. The past century has been a postcolonial roller coaster ride for the Philippines. Today, the Philippines' developing economy has sparked international interest and the country has been marked as having one of the most promising potentials for economic growth in the world. The History of the Philippines offers a comprehensive account of the Philippines and its struggle to discover a national identity. This volume is an excellent addition to any library; perfect for student and general readers. On December 8, 1941, one day after the bombing of Pearl Harbor, the Japanese Air Force struck the Philippines in the first blow of a devastating invasion. With an undersupplied patchwork army at his command, General Douglas MacArthur led a valiant defense of the Philippines. When defeat came, MacArthur swore he would return, while thousands of POWs fell into Japanese hands — and faced a living hell that many would not survive. In this gripping oral history, Gerald Astor brings to life the struggle to recapture the Philippines: the men who did the fighting, the battles that set the stage for an Allied invasion, and the acts of astounding courage and desperation that marked the campaign on both sides. From Corregidor to the Battle for Manila, from horrifying jungle warfare to cataclysmic clashes at sea, on beachheads and in the air, Crisis in the Pacific draws on the words of the men who were there — capturing this crucial heroic struggle for victory against Japan. Gerald Astor is an outstanding author of oral history books on World War II, and this is another fine effort of his. Thoroughly informative and thought provoking book, makes me thankful that the pilots, soldiers, and sailors were willing to undergo such tremendous hardships to purchase the freedom we enjoy today. May we never take it for granted! Gerald Astor is one of those guys who writes oral history of various World War II battles. This is one of his books, a pretty good one, but since the battle is so complicated things get a little lost. The Philippines were the setting for a considerable amount of fighting during World War II. The Japanese began their attack on the islands within hours of Pearl Harbor, and invaded within days. When they conquered the last of the islands in the Spring of 1942, they began consolidating their hold on them. Two years later, American forces returned, invading first one island and then another, reconquering much of the archipelago before the Japanese surrendered. This book chronicles the experiences of American army and army air officers and men during the battle, along with a few sailors. The author provides a brief summary of each action that took place, and then gives you one after another oral account of the fighting that took place, pretty much all of it from the American point of view. There are a very few accounts from civilians (none Filipino) who were present during the fighting. There aren't any accounts from the Japanese side, either. The narratives from the American soldiers and other participants are interesting, but since the overall narrative is so confused, the author has a hard time providing context for what's going on. After a while, the book becomes rather confused, and the whole story bogs down. I generally find oral histories to be interesting, provided the author works hard to give some context to what's occurring. Here, sadly, the author fails in this regard. The book does provide the oral history itself...but nothing else, really. What do you know about the Battle for the Philippines? Like most, you probably know that: 1) The Japanese invaded, 2) There were intense defensive delaying actions fought at Bataan and Corregidor, 3) MacArthur escaped vowing "I shall return!" 4)Captured survivors suffered greatly in their forced march from Bataan, and 5) Later, MacArthur did triumphantly return and everyone lived happily ever after.But there's much more to this battle than all that.Read about how MacArthur altered the defense plan for the archipelago from the original US plan and why he did so. See how the Imperial Japanese Navy almost dealt a blow to the US Naval Task Force.Learn why MacArthur was portrayed in the limelight (it wasn't personal vanity as some might think).But most of all, experience the bitter conflict through the eyes of the men who made it possible, and also paid for it.Astor's work is very readable, informative, and entertaining. Excellent review of the war in the pacific. This story is long overdue. Hats off to Mr. Astor for the way he intermingled history with the personal stories of the courageous men and women who endured, fought and overcame anextremely vicious enemy. 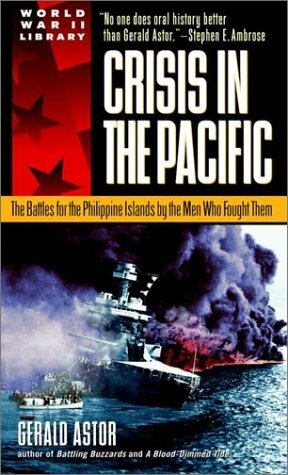 Anyone who had a family member in the pacificduring WWII should read this book! Thank you Mr. Astor for a job well done! The only thing wrong with it is that it is slightly out of date. Published in '89, it ends with Cory Aquino's presidency. 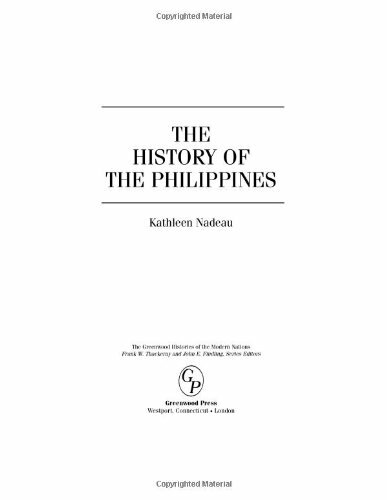 While out of date, it's the only book I'm aware of that exhaustively covers the Philippines modern history- and a fascinating history it is. Most Americans don't realize how intertwined our history is with the Philippines. 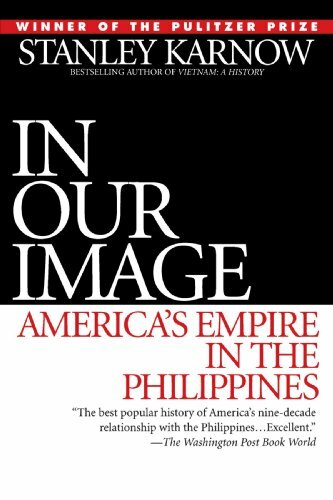 A Filipino academic friend of mine told me that this book is controversial among some Filipinos for it's supposed pro-American slant, and it's supposed apologist attitude towards U.S. imperialism there. I can't really see this, though. I think it's pretty even-handed and free from editorializing. To a Westerner, the Philippines is a mass of contradictions. A country in which the most vocal calls for representative democracy can come from an unelected, unaccountable male leader of the catholic church; a society in which national identity and patriotic culture are expressed through foreign rituals from TV game shows to the school flag-salute; where the elements most identifiable as Filipino are remnants of imperial conquest - from Spanish patronymics to the ubiquitous catholic faith and to the Filipino language itself. This impressive work by Karnow presents the history of the Philippines as the history of underdevelopment. He repeatedly returns to the conclusion that the Philippine economic model is basically feudal, with absolute power wielded by a land-owning class consisting of wealthy dynasties. The social structure at the time of Spanish conquest in many ways resembled Anglo-Saxon Britain.Rather than challenge this ancient society, 300 years of Spanish rule, 50 years of US rule and 50 years of US rule-by-proxy reinforced the plutocracy. The concept of a unified nation governed by a democratic process is an illusion the imperial masters where happy to promote for their own purposes. Karnow shows how the US relationship has largely made the Philippines what it is today. He shows with great insight and masses of evidential detail how the relationship moved from an initial benign mission to liberate and improve the lives of the Filipinos, eventually to a cynical desire to protect US interests, primarily to maintain the air and naval bases from which the Americans rained death and disaster on Vietnam - the common point being the primacy of US domestic politics. I read this book at a time when Ninoy Aquino's son Noynoy is launching a carefully-managed campaign for the presidency, based on appropriating the myths and images surrounding his murdered father and recently-deceased and hugely revered mother Cory.Noynoy's naive and shallow discussions on policy are unimportant - to win he needs to conflate a sense of dynastic entitlement with a sanctified narrative of good over evil. The Filipino body politic seeks Messianic leaders and almost wants to be deluded. In what other society could Imelda Marcos, having been party to Ferdinand's plunder of $20Billion return to the country and be touted as a presidential candidate? And when denied, enthusiastically promote her children as suitable members of congress? In what other society can an ex-president (Erap) do jail time for plunder, then return to our TV screens as a sought-after celebrity, and, yes, be touted as a future presidential candidate? Karnow's account of the recent history, and his thesis of a feudal Philippines certainly go a long way to explaining how such things can happen in a society which works hard to give the appearance of a modern democracy. His narrative ends during Cory's presidency, but his underlying conclusions are still well true today. In summary the book is impressive in its wealth of detail and its extensive use of highly authoritative sources. If you are interested in the Philippines, get a copy. This is a fantastic book about US-Philippines relations and history.Stanley Karnow produces a tour de force of both history and writing, and I must say this is a far superior book than his better known history of the Vietnam war. The book goes back all the way to Magellan but quickly (and efficiently) moves to the Spanish American War; but as a result the casual reader will understand the influence and importance of monastic orders and much of the situation of the Philippines when US troops finally arrive. The build up to the American-Spanish war, the internal American politics, and the American cultural environment are very well presented.I do believe Spain was given to little attention in their internal details, but there is only so much the author can do in a single book and preserve it as coherent, the situation within the Phillipines is very well covered.Afterwards we get a detailed view of the military operations in the Phillipines from both the nationalists and the American point of view, and the subsequent American efforts at colonialism/democracy building. The reactions in from the Americans on the democratization process and their view of the people of the Phillippines are incredibly interesting and covered by many curious anecdotes. The book is somewhat timelier now than ever due to America's renewed interest in forging democracies; also, due to the book's age, Karnow's most frequent analogy is to the Vietnam War, but the more modern analogies become even clearer by remaining unmentioned.Karnow doesn't flinch from depicting the racism and general low impressions by the Americans towards there "little brown brothers". Also the brief description of several figures such as Taft, Roosevelt, and many others is quite interesting since they are rarely seen when dealing only about this subject. Overall an informative and entertaining book, and with the added benefit of being about a subject most have not read anything previously. For most people, the Philippines is an exotic land that was once our colony and cannot understand why they kicked us out of our bases there in the 1990s. The late Stanley Karnow provides us with a remarkably unbiased account of its history and truly educates us on these remarkable people. This is volume XIII of Samuel E. Morison's History of United States Naval Operations in WWII, and the eighth of nine on the Pacific theater.In it, Morison relates the recapture of the remainder of the Philippine islands after the Battle of Leyte Gulf in volume XII.Mindoro, Luzon, Mindanao and others are recaptured from the Japanese, who now have practically no navy to speak of.However, the Japanese Kamikazes emerge in force, and quickly prove a daunting hazard to U.S. naval and amphibious forces. As always, Morison spares no details on the specifics of the amphibious landings.This time, however, the beach assaults have to deal with Kamikazes targeting not only regular surface ships but LSTs as well. Of special interest in this volume is the typhoon of mid-December, 1944, which damaged Halsey's task force to the tune of three destroyers, eight hundred lives and many aircraft.The same admiral who let Kurita pass unmolested through the San Bernardino Strait on October 25 is now investigated for neglect in allowing his task force to be battered by a typhoon east of the southern Philippines on December 17-18.Morison lists Halsey's "commendable zeal" for supporting the Luzon landings as one of the reasons for the typhoon disaster. The Philippines is a country in its adolescence, struggling by fits and starts to emerge from a rich, troubled and multilayered past. 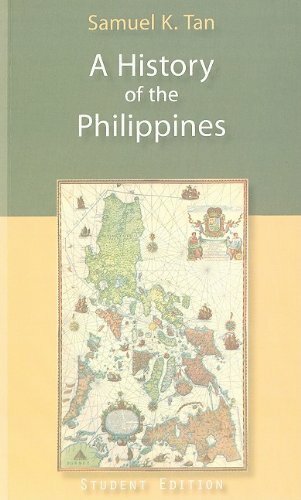 From its first settlement through the arrival of the Spanish in the 16th century to the subsequent American occupation and beyond, History of the Philippines recasts various Philippine narratives- familiar and unfamiliar-with an eye for the layers of colonial and post-colonial history that have created this diverse and fascinating population. 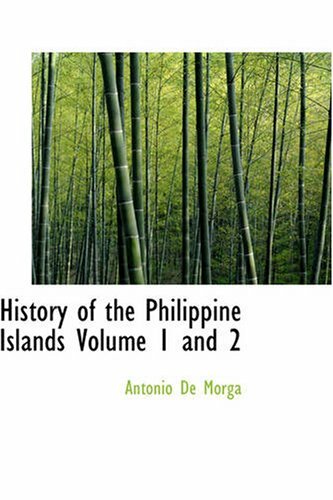 History of the Philippines is intended for those who are curious about this Southeast Asian archipelago but know very little of its history. 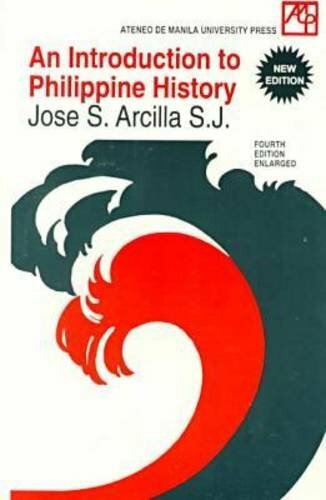 The narrative moves from a pre-Hispanic Philippines in the 16th century through the Spanish American War, the nation's tumultuous relationship with the United States, and General MacArthur's controlling presence during WWII, up to its independence in 1946 and subsequent years of Islamic insurgency. 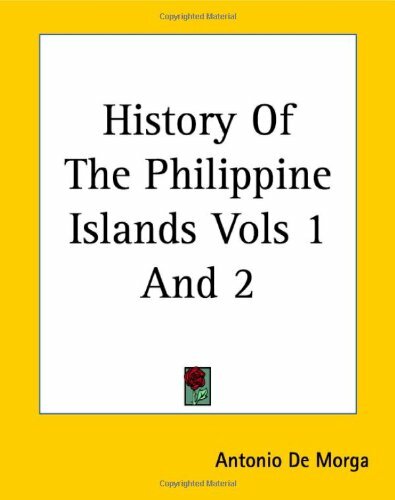 //A History of the Philippines// is, as the title suggests, a comprehensive history of this Southeast Asia archipelago, which contains more than 7,000 islands. 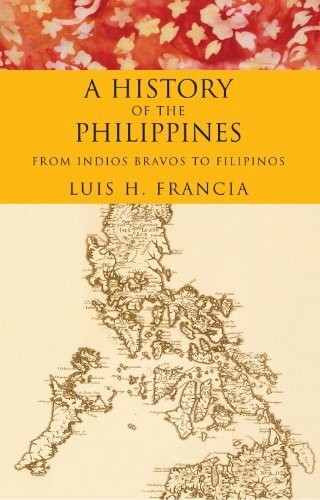 Luis H. Francia, a professor as well as an author, details the history of the Philippines from pre-Spanish colonial times up to present day. The fascinating story of the Philippine nation itself is enough to make the book worth reading, but Francia's excellent presentation makes it imminently accessible. The author integrates political, cultural, and economical events with ease allowing for a holistic view of the peoples of the Philippines. Also, he presents a clear picture of the impositions of Spanish and American imperialism and internal government corruption without adornment. Though the nation has inherited many challenges from past exploitation, Francia does not ignore the revolutionary heroes and civilians who were and are committed to bringing about a sustainable, economically independent future for the Philippines. //A History of the Philippines// will appeal to general readers and history buffs alike, especially those with an interest in Southeast Asia. Additionally, the book serves as an excellent supplement to any foray into American history, due to the U.S.'s intense involvement in Philippine affairs for over the last 100 years. 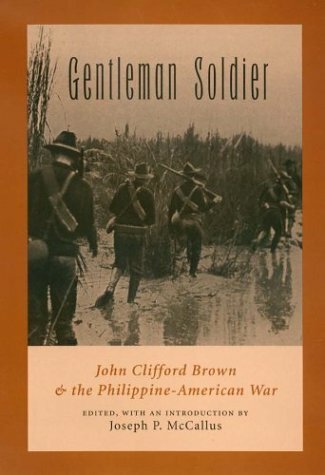 "Gentleman Soldier: John Clifford Brown & the Philippine-American War," edited by Jospeh P. McCallus, is part of the Texas A&M University Military History Series.The heart of this book is made of the letters and journal entries of Brown, an American soldier and veteran of the U.S. campaign in the Philippines.Brown's wartime writings were previously published in 1901 with the title "Diary of a Soldier in the Philippines"; McCallus notes that "Gentleman Soldier" contains the complete, unabridged text from that earlier book. Brown's text is richly supplemented with additional material: a thorough general introduction by McCallus (pages 3-55), the introduction to the 1901 text, endnotes, a list of works cited, and an index.The visual appeal of the book is enhanced by a generous selection of photographs, as well as by maps.McCallus divides Brown's text up into five chapters and provides a separate introduction to each chapter.The sixth chapter is drawn from an unpublished 1951 manuscript written by Brown's sister; McCallus provides a separate introduction to this chapter.Brown's own dated entries run from June 1899 to August 1900. In the intro McCallus gives some background on Brown.Born in Portland, Maine in 1872, Brown was a graduate of the Massachusetts Institute of Technology and served as a captain in the volunteer Army.He then enlisted as a private in the regular Army's Corps of Engineers, and served as a combat zone cartographer in the Philippines.Brown's writings, which document his wartime service as an enlisted soldier, constitute a rich and fascinating human document.He covers many topics: his work as a cartographer, the activities of the Philippine insurgents, soldiers' recreation activities, the differences between regular and volunteer military forces, and the memorable milestones of his own military career.Particularly interesting is his detailed account of the food that he and other soldiers ate; at one point he even includes a complete week's worth of menus for all three daily meals. I found this book to be of barely acceptable editorial quality, and the writing can sometimes be infuriatingly disjointed.A disappointment, considering the book was authored by a Jesuit.Nevertheless, I cannot bring myself to completely reject it, owing to this book's brevity and lack of competition.I was glad to have read a brief survey of Philippine history just to get the larger structural elements in place, but because the writing is so uneven, the book's value is severely limited, even as an introductory text.For that reason, I would not recommend it for instructional use.Yet, if you devote an afternoon to this book, you'll at least have a beginning as a reader in Philippine history, but it cannot be overemphasized that further reading is a necessity. It has been termed an insurgency, a revolution, a guerrilla war, and a conventional war. As David J. Silbey demonstrates in this taut, compelling history, the 1899 Philippine-American War was in fact all of these. Played out over three distinct conflictsÂ--one fought between the Spanish and the allied United States and Filipino forces; one fought between the United States and the Philippine Army of Liberation; and one fought between occupying American troops and an insurgent alliance of often divided FilipinosÂ--the war marked America's first steps as a global power and produced a wealth of lessons learned and forgotten. First-rate military history, A War of Frontier and Empire retells an often forgotten chapter in America's past, infusing it with commanding contemporary relevance. Good, short, one volume history of the US-Philippine conflict.Only issue I had with it is that it would have been better with a few more maps. 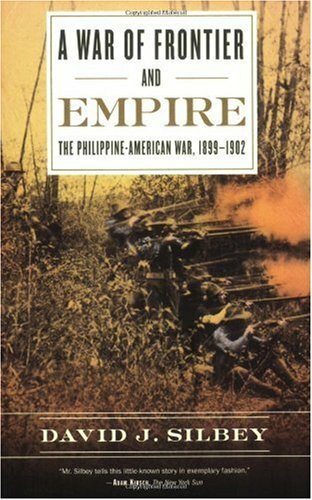 Professor David Silbey's book and others like it only covers the war that was waged between the Americans and the Filipinos that took place between 1899 and 1902. However, the conflict continued in the Southern Philippines between the Moros (i.e., Mulims) and U.S. forces and continued up until the eve of the FirstWorld War. In many ways this conflict parallels the current conflicts in Iraq and especially in Afghanistan. First, the war was one in whicha non-Muslim nation invaded and took possession a Muslim one that wanted no part of one that was essentially Christian and Western. The Moros had been fighting the Spanish Catholics for centuries and believed that the defeat of Spain by the US signaled that at last they would be able to own their country. Second it was an extremely brutal war. you could say that the Moros invented the concept of "suicide bombings". Although they did not use explosives they often hurled themselves into a crowds of US soldiers and other Filipino non-believers armed only with a "Kriss" ( long-wavy sword) andkilled or wounded as many as they could before they themselves were struck down,believing that those who died in a Jihad would be amply rewarded in the afterlife. We get the words "melee" and "amok" (running out of control) from this Moro war-waging and terroristic practice. Supposedly this Moro practice speeded up the arming of U.S. troops with the .45 caliber automatic pistol. Another parallel were the atrocities ascribed to US troops. Prime example werethe massacres at Bud Dajo in 1906 and Bud Sak in 1911. In the former. troops led byColonel J.W. Duncan, assaulted the volcanic craterwhich was held by 800 to 1000 Moro rebels, including women and children and killed all but six. Most died as a result of artilly and machine gun fire that was poured down from the rim of the crater.Another instance of atrocitywas the custom of wrapping a dead Moro man in a pig's skin and stuffing his mouth with pork. As the pig was an unclean animal in their religion, this was considered an ultimate defilement. The war finally petered down when American military commanders realized that a viable accommodation to Muslims and their culture was the only way to achieve peace. In sum, its a shame that Silbey limited himself tothe two-year conflict as a book that covered what I call the "war after the war" would have been more useful especially in the context of the current situation. I found the book highly readable and a good accounting of the topic. I have found other material on the subject highly colored by politics or other motives that this book did not have. Read this if you like a good historians coverage. He gives ample coverage to many angles through a well referenced series of materials. I was surprised at the negative comments others gave since so few books are even available, or as written by historians who want to introduce us in a comprehensive way to the topic. Perhaps unfortunately what some may decry is the lack of good reference in some areas because there are none. As an example documenting the numbers of Cholera deaths is no easy task. So perhaps some other the comments relate to something that is not the authors fault, no solid material exists to reference and only speculation is available. This is the best readable material that I have ever found on the subject. I would highly advise reading it. Most people have forgotten about the Philippine war. That is a shame. That little known war has shaped policy for the US for a lot of the 20th century. The war also has some valuable lessons for US military policy in the 21st century. This book is a good story of the first two years of the war. It is written in an easy to understand format. It flows very well in an entertaining way. If you are looking for an in-depth book on the subject this isn't that book. There are seven or eight more years of the conflict he doesn't address. Also the US Army stayed in the Philippines for the next 40 years or so. Our ties there lead to large numbers of the US Army being lost there early 42 and later when we invaded in 44. How the war was fought then helped form the nation of the Philippines as it is today. Some of the books stories or the war stories have lessons for us today. In some ways the war sounds like the Iraq war. The war wasn't popular back home either. The question of why we were there echoed across the country then much like the issue about Iraq does now. People forget that war was a guerrilla war which we won. How we won might have lessons that help us today. Of course as you read about the how you will ask yourself if we want to win. The hard stick approach then definitely works. However with 24/7 news coverage we have to ask if we have the stomach for that approach. The book also briefly talked about a critical thing the Army did. This technique was priceless to the war effort. That thing was how they rebuilt the culture. US garrisons became city government. They set up schools to educate the population. Over time the Army introduced the locals into running things. This technique gave the land some strong institutions. However such approaches involve a lot of money but changes hearts without killing people. Today's sensitivities shackles efforts to do such things today. The Army then didn't have those problems. The author also does a good job of describing the environment. The harsh jungle descriptions, the mentioning of environmental events like epidemics and it's effect on operations helps add depth to the story. Overall everyone will like this book. It opens up a secret in US history all should know about. 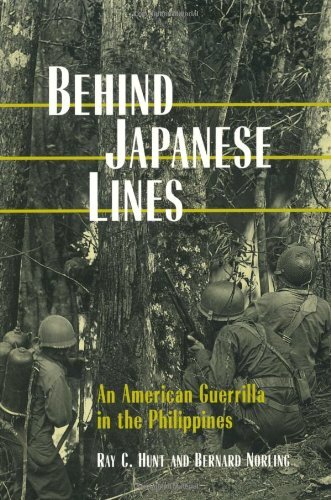 "Behind Japanese Lines" is the story of one man's battle against disease and the Japanese as he continued to fight after the American defeat in the Philippines in World War II.Between MacArthur's departure and his return, a few brave Americans avoided capture and organized some of the Philippine resistance.Capt Ray Hunt was one of those brave men, and in this book he recounts his personal experiences. Seeking any way to avoid being an infantryman, Hunt enlisted in the air corps to be an aerial gunner.As the inadequate American defenses in the Philippines fell to the Japanese onslaught in 1941, the airmen were forced to pick up rifles and fight a delaying action - bringing to reality what Hunt was trying to avoid.But his nightmare was just beginning.Hunt was among the Americans captured and forced to march in the infamous Bataan Death March.After witnessing acts of brutality along the march, Hunt took advantage of an opportunity to escape Japanese control.He slipped into the jungles and connected with the Filipino population to begin his 3-year resistance from behind enemy lines. Hunt's work provides the reader with a sociological look at the life of a guerrilla.Rather than focus on the details of individual battles, the book generalizes the experiences of guerrilla life. Every conquered population walks a fine line.You must comply enough with the occupiers to avoid being killed, but not too much of being accused of being a collaborator.Hunt offers his perspectives on many of the groups operating in the Philippines.The Japanese recognized Filipino leaders to act as a constabulatory forces to keep order in the cities.These Filipinos were charged with running the towns, but had to walk the fine line separating cooperative/collaborative.The Hukbalahaps were driven by the communist ideals of establishing a Marxist state.Hunt worked with a third group of forces with the aim of restoring the Philippines to native rule after the war. With the disparate motives of these groups, in many instances the groups would fight each other almost as much as the Japanese. The book was my first experience reading about the Filipino efforts to resist Japanese occupation. I would highly recommend this book to any World War II history enthusiast. This is a very interesting book about one man's experiences as a guerrilla fighter in the Philippines during World War II.Initially captured at the fall of Bataan and forced to endure part of the Death March, he escapes and spends the next three years hiding out from the Japanese and waging a guerrilla campaign on Luzon.There isn't much combat in the book, but it has lots of interesting stories about the Philippines, other guerrilla fighters, prominent Filipinos and a life filled with the constant worry of capture, torture and death at the hands of the enemy.Definitely a must read if you're into Filipino culture and history, but not so much if you're looking for lots of action. There are some better books covering this subject, but this book is still a decent read and I recommend it for those interested in this theater of war.Hunt's story of survival from the Bataan death march and his eventual work with a guerilla detachment were very good and include many personal aspects.But if you are looking for a lot of "combat" recollections, those are not here.This is a more general and personal account of survial. In addition, at times, the author's main purpose in writing this book seems to be to respond to and challenge other US-led guerilla leaders who have either written their own accounts or were considered rivals to Hunt and his leaders. This detracted from the overall story in my opinion, but perhaps this is important contribution from a purely historical aspect. Ray Hunt has turned out an informative book of his World War II years, first as an American soldier in the Philippines, secondly as a prisoner and escapee from the Japanese, and third as a guerilla fighting the Japanese until the American army finally re-captured the islands. Personal accounts of guerilla war are likely to be replete with fabrications as the participants build themselves up, tear others down, and exaggerate their exploits.Hunt seems more honest than most.He doesn't sugar-coat his actions, nor portray himself as the second coming of Napoleon. The book alternates between describing his personal experiences and putting them in context with descriptions of the various guerilla movements in the Philippines, including the Communist Huks, local politics, an account of the American invasion, and his own role as a guerilla leader.He strives to be fair and balanced and comes closer to achieving that than does Fox News. The best part of the book, in my opinion, were the several chapters in which he described his life on the run from the Japanese, the hardships and disease he suffered and overcame, and the assistance he received from Filipinos. My criticism of the book would be that Hunt never really describes in detail the military operations the guerrillas undertook. Thus, it is somewhat difficult to evaluate the contribution guerilla groups made to winning the war. Hunt's story of his three years as a guerilla in the jungles, mountains, and rice paddies of Luzon is vivid and credible.This is probably one of the better books you can read about the Philippines under Japanese occupation. We received the book promptly however preferred hardbound copy, which Amazon may not have had in stock.We are still seeking hardbound copy although this extra paperback will suffice for our research. This should be required reading re WW2 history in schools and colleges;and should be in all libraries. This is a visually, lushly written history of the people, the land and the tragic environmental devastation and chaos of a once ideally picturesque country.Goldoftas shares with you her journey, her appreciation and respect for the Philippine culture and landscape.She draws the full circle and connections between the political, economic and practical realities and forces that caused this environmental destruction and how it created a domino effect of tragedy, and unending economic difficulties.It is a book that I highly recommend, to read, to learn and through this knowledge, let's hope be able to prevent further destruction. 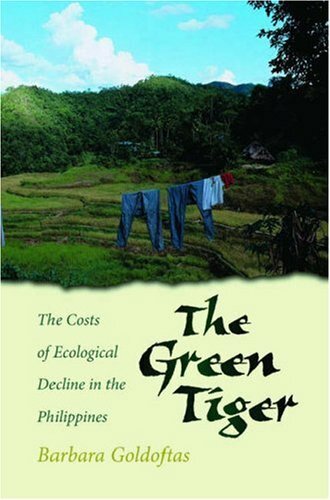 Barbara Goldoftas delivers a moving and insightful illumination of the conflicting forces of politics, economics, religion, and environmentalism in her concise depiction of the destruction of the once-pristine Philippine ecology. Clearly loving the country and its people, Barbara Goldoftas even-handedly explores the reasons for the Philippine's environmental decline, unflinchingly ascribing responsibility where it belongs, yet she offers concrete examples of hope for remedy and remidiation. For realistic environmentalists, this is required reading. This is an interesting book that describes environmental problems in Philippines from the perspective of a writer who also makes her own perspective very clear. It has useful information about what has happened there, and plenty of colorful anecdotes. A good read for anyone who wants to know about the Philippines. Here is a beautifully written, courageous memoir of a wartime childhood behind enemy lines. When the Japanese bombed Pearl Harbor and simultaneously attacked the Philippines, eight-year-old Mary McKay, her parents, and several other American families working on Mindanao fled into the jungle for what they thought would be a short evacuation until they could be rescued by the Navy.Their wait lasted two years. My Faraway Home is the fascinating story of how they survived. The refugees encountered typhoons, fires, and cobras; they lived on dwindling stores of canned food, traded with loyal Filipino villagers who wouldn't betray their hideout, and learned to improvise their own shoes (from rubber tires), soap (from pig fat), and other necessities. Into this upside-down world of anxious waiting and frayed tempers came occasional simple joys-a Fourth of July feast, a birthday party, a pet goldfish in a glass jar. 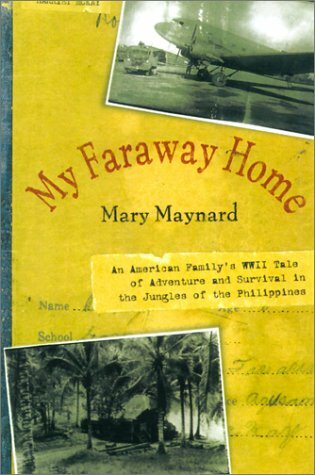 Mary Maynard also describes their escape on a submarine dodging enemy torpedoes, and recounts how her teen-aged brother, away in boarding school when the Japanese invaded, survived a prison camp and the bombing of Manila. The author and I both attended the American School Manila albeit she was class of 1951 and I was 1959. This book was brought to my attention by Peter Parsons, son of Chick Parsons who was a true hero during the Japanese occupation. I read it slowly absorbing the minute details and essence of the story page by page. I could smell, see, hear, and feel her words while she grew up on Mindinao and in the mountains hiding with her family as others were slaughtered or held in Japanese concentration camps.By reading this journal one will realize how brutal the Bataan Death March and incarceration by the Japanese truly was. At the same time one will learn about life, escape and evasion as the enemy grew closer and closer to their jungle hideout. This is a must read for those interested in growing up in a foreign land, suffering under the dictatorship of a tyrannical country, and family endurance. It is also for those interested in Philippine history before during and after WWII. Hats off to you Mary! I have not yet finished reading this book, but it has been an important find in my research and recurring interest in World War II.As is the nature or a "World War", much of the world is involved.For this little girl in 1930's Philippines, her whole world became involved.She understood very little except that all the adults were behaving strangely, and no one was explaining much of anything. Racial prejudices that we may not even consider today were large in that time and place.Survival ended up depending upon eliminating those racial lines that were even drawn to include foods that were acceptable versus "native".One had to eat to live, and the native foods were what, in the end, were available. I'm not sure what I expected when I selected this volume, but it has turned out to be a rich little gem.I have come away with a reminder of the propriety of those times, a view of the tolerance of the natives versus the intolerance of the mine workers, and a brilliant child's eye view of World War II. I moved to the Philippines ten years after WWII. The recovery process was still very evident.I could relate to Mrs. Maynard's description of their living conditions, the local food they learned to like, their living quarters, the jungle and most of all the gentle people of the Philippines.The book is exceptionally well written covering a lot of detail without ever being tedious. This is a marvelous book and makes for fascinating reading. Gave me pause to reflect and wonder if I would have the strength to endure a similar hadrship.WWII was such a long time ago and it shaped the lives of so many people around the world.It is great that there are some really worthy movies available to educate the young people about sacrifices made by their grandparents (I should say great-grandparents) generation. When the Japanese invaded the Philippines in World War II most American soldiers and civilians surrendered. A few took to the hills and spent the war years as guerillas or simply hiding out from the Japanese.The author was an eight year old child during the war, the daughter of an American couple managing a gold mine on the island of Mindanao.They chose to live in the jungle and evade the Japanese. They didn't have any thrilling adventures, but the description of their day-to-day life is vivid and interesting. The author doesn't pull any punches about her experiences.Neither of her parents are sympathetic people, nor are many of the other characters.She tells us of being sexually molested by an older boy.She gives us a picture of the stress the fugitives were under from the standpoint of a young girl. One of the interesting aspects of the book was the almost-total separation of foreigner and Filipino before the war. The foreigners, mostly Americans, were unfamiliar even with Filipino food.Western men who married Filipino women were outcasts and the social and cultural separation of the cultures was almost complete.The automatic assumption by Americans and Europeans of the superiority of their cultures has broken down in part over the last half-century -- and that's a good thing. As a true and true-to-life story of people uprooted by war, this is one of the best you will find. I read this book here in Brazil.This book is short, easy to understand and good.The subject of this book is the american defeat, on the Philippines in 1941 and 1942.